Since the ancient times, Tibet has always appeared to be mysteriously unreachable, being like a magnificent citadel, situated aloft a very high sacred mountain. Hence, in the past, only very few fortunate people were able to reach and experience Tibet’s mesmerizing uniqueness. At present, however, thanks to modern means of transportation, Tibet is already very much accessible to travelers and tourists. In fact, there are hundreds of flights going to the major cities of Tibet like Lhasa and Shigatse. Aside from these flights, Tibet is also readily accessible by train and automobile. At present, there are five direct trains that service commuters going to Tibet. Additionally, there are five overland Tibet highways that converge in Lhasa from different points of origin outside of Tibet. Tibet can be generally reached from two basic access points, namely: the mainlands of China and Nepal. Hence, all points of entry to Tibet generally originate from these two countries. For this reason, if you want to travel to Tibet, either you would have a tour package whose itinerary starts in Nepal as access point or one that emanates from the different cities of mainland China. How to Secure Tibet Travel Permit from Nepal? Since time immemorial, Nepal and Tibet has long been associated with each other, and in the past, the tour of Tibet generally went via Kathmandu, Nepal. The reason for this is that Tibet and Nepal lie adjacent to each other. Moreover, Nepal is the closest overland gateway to Tibet. The linear distance between Kathmandu to Lhasa is barely 600 kilometers or 373 miles. The overland distance, however, is 1,000 kilometers or 621 miles. Interestingly, the fastest way to Tibet is via Kathmandu by plane. Two airlines, namely, Air China and Sichuan Airlines service the air route between these two places. At present, there are 8 flights from Nepal going to Tibet once a week, and flights offered by the Sichuan Airline depart every other day from Kathmandu to Lhasa and vice versa, while flights offered by Air China leave every other day from Kathmandu to Lhasa and vice versa. If you travel to Lhasa by plane from Kathmandu, there is a big chance that you would get a bird's-eye-view of the peak of Mt. Everest because these flights generally pass by the Himalayan Mountain Range. If the weather permits, you can see the peak of Mt Everest by the window. Furthermore, going to Tibet from Nepal allows you to gradually acclimate yourself to the high-altitude weather of Tibet, and help you avoid the usual high-altitude sickness concomitant with moving abruptly from a lower-altitude place to high-altitude place. One of the favorite routes by tourists to Tibet is via the overland route from Kathmandu to Tibet. You can travel this route by kinds of vehicles. 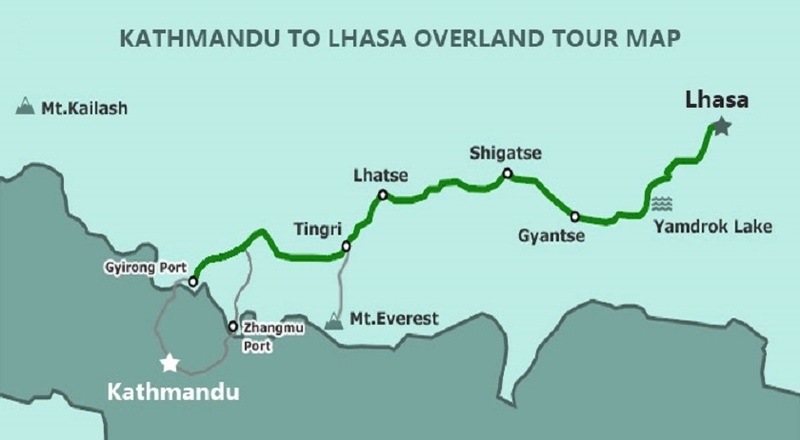 This overland route starts from Kathmandu and passes via the Sino-Nepal border. This overland route cruises along the China-Nepal Highway which is also popularly known as the “Friendship Highway.” It would usually take you around 3 to 5 days to complete this 943-km overland road trip. As mentioned above, the flight from Kathmandu to Lhasa may permit you to get a glimpse of the summit of Mt. Everest. On the other hand, however, the overland road trip from Kathmandu to Lhasa would surely offer you a spectacular roadshow of some of the best tourist attractions of Nepal and Tibet. Along the way, you can see awesome vistas that you would never get to see if you travel to Tibet by plane. Moreover, you'll get to pass the other cities and towns of Nepal and Tibet, plus you can drop by the Everest Base Camp (EBC) along the way and get a glimpse of the majestic mountain. This is the reason why overland Nepal Tibet tour usually takes three to five days, depending on your stopovers along the way. The route from Kathmandu to Lhasa usually passes via the Sino-Friendship Bridge, Zhangmu, Nyalam, Tingri, Shigatse, and finally to Lhasa. The tour from Nepal to Tibet necessitates securing a Tibet Travel Permit. This permit will allow you to board a flight or make an overland trip from Nepal to Tibet. You will never be able to secure other necessary permits if you weren't able to secure the Tibet Travel Permit. Furthermore, you would never be allowed to enter Tibet without availing of organized travel tour package. Tibet Travel Permit cannot be applied by an individual, which means you need to ask help for a local Tibet tour operator. After you have confirmed your itinerary and have secured a tour package from authorized Tibetan owned travel agency, you simply need to mail your passports to the travel agency in Lhasa. The travel agency, on the other hand, will secure for you the Tibet Travel Permit and visa invitation letter. The visa invitation will be issued to you by the Tibet Tourism Bureau. This securing process usually takes around five to seven days. Besides the Tibet Travel Permit, travelers should hold some other permits before sitting foot in Tibet. Group Tourist Visa is required and it can only be applied by a local travel agency. Your tour operator will help you apply for it. So you don’t have to worry about it. Afterwards, the agency will give you the issued visa in Kathmandu, and off you can start your tour of Tibet. If you would choose to travel to Tibet from the Mainlands of China, the fastest way to arrive in Lhasa is to take the non-stop flights in the major Chinese cities, including Chengdu, Chongqing, Xi'an, and Shangri-La. Flights from these four cities to Lhasa usually take two to three hours. Additionally, the flight tickets usually cost somewhere between 270 USD to 350 USD. You may also board a plane from Beijing, Guangzhou, and Shanghai, although the flights coming from these three cities generally make a stopover in the abovementioned four cities of mainland China. The cities of China that offer most international flights to Tibet include Beijing, Chengdu, and Shanghai. Many tourists usually choose flights to Tibet that offer stopovers to other famous cities of mainland China, affording them a more fulfilling trip of both the Chinese cities and Tibet. These tourists usually avail of tour packages that include stopovers and sightseeing within the stopover cities. Flying to Tibet via mainland China is definitely one of the most efficient and fastest ways to get to Tibet considering that Tibet is perched high at the Qinghai-Tibet Plateau. Most of these flights usually make a stopover at Chengdu, because Chengdu is the nearest and most strategic city, leading to Tibet, with more than 10 flights to Lhasa everyday. You should therefore check if your flight itinerary includes Chengdu, for from Chengdu, it would be easy to reach Tibet. Once your plane reaches Chengdu, your travel agent will meet up with you and hand you over your Tibet Travel Permit. With your Tibet Travel Permit in hand, you can then board a plane going to Lhasa. Chengdu has maximum flights among those cities. There are around ten daily flights to Lhasa from Chengdu, and you can board one of these scheduled flights. Moreover, flights from Chengdu are often the cheapest ones with lots of perks and discount opportunities. Always remember that a stopover at Chengdu is not only convenient for reaching Tibet; it can also be very meaningfully memorable because there are many tourist sites to visit in Chengdu. First, it is the location of the Giant Panda Research and Breeding Center. Moreover, Chengdu is one of the most historical places in mainland China. You will have a great chance to visit some famous cultural relics such as Dujiangyan, Mount Qingcheng, Du Fu Thatched Cottage, etc. Although boarding a plane to Tibet from mainland China is very convenient, on the other hand, the Tibet train tour from mainland China is not without its great advantages. First, taking a train to Tibet is considered the cheapest way from the mainlands of China. In fact, Tibet train tour is around ½ times cheaper than air travel. Moreover, it affords you a once-in-a-lifetime experience of traveling along the highest railway system, Qinghai Tibet Railway, in the world with the snow-capped mountains, grasslands, vast desert, and beautiful lakes as the backdrop. Prior to the inauguration of Qinghai-Tibet Railway—considered to be an engineering marvel—land travel to Tibet from mainland China is very cumbersome and perilous. With its inauguration on July 1, 2006, China Tibet overland tour had become very convenient and fast. The capital of China is Beijing, and if you want to travel to Tibet from your country via mainland China, you can take the direct flight to Beijing. And from there, you can board a train which heading to Tibet. Upon arriving in Beijing, you can first explore Beijing and stay there for 2 to 4 days. Trains from Beijing usually take around two days to reach Tibet, and Beijing-Lhasa trains are definitely filled with tourists all year long. Another important railway point is Xining which is a Chinese inland city. If you want to avoid the long train ride from Beijing to Lhasa, you can opt for a flight to Xining and from there, you can take a train to Lhasa. 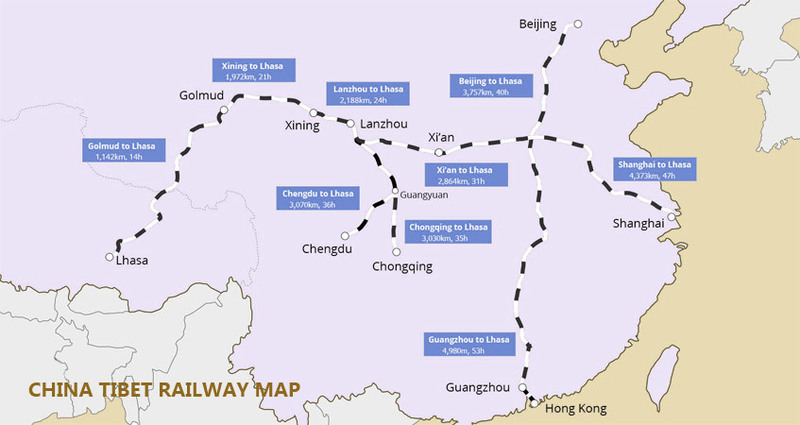 All trains going to Tibet from other cities of mainland China generally pass by Xining, and the Qinghai-Tibet Railway starts at Xining. The scenery in Xining to Lhasa part is most attractive. You must have a grand eye feast along the Qinghai Tibet Railway. If you are entering China from the south, you can use the Sichuan Province as your entry point. Chengdu, the capital of Sichuan Province has trains that depart every other day from Chengdu Train Station. Trains from Chengdu usually reache Tibet after almost 43 hours. You can also board a train from Guangzhou. Guangzhou Tibet train is the longest railway, and it usually takes around 54 hours to complete the whole journey. Another option is to use Shanghai as your entry point to Tibet. These trains depart from Shanghai every other day. To sum up, If you expect a more intimate experience with the culture of Tibet and China, it would be best to travel by train. Simply because it affords you a close encounter with the ordinary citizens who take a train to Tibet. Moreover, there are platforms along the train stations leading to Lhasa that allow tourists to view the spectacular sites along the way. So, if you are the adventurous type of traveler, you would surely find that Tibet train tour is a more appealing option to take.